Style Tip: This outfit is a great way to show restraint and let the trend speak for itself. You don’t need to overload your outfits this Spring/Summer 2018 with too many accessories. Less is more when it comes to fashion. Outfit Details – Floral romper styled with tie up flats, a bracelet, and classic sunnies. Style Tip: If minimalism isn’t your thing, this over the top outfit will definitely speak to you. It’s a masterclass in knowing which accessories go together and having a central color theme helps to draw the eye to all the details. Outfit Details – Body chains in bronze and gold, cotton candy hair, flash tattoos on the face and neck, matching lycra bottom and bandeau top in pink. Style Tip: This is the perfect “rave to lunch” look and can be styled up or down, depending on the kind of fashion statement you’re trying to make. Use more accessories like chokers to add an edge to this outfit or tone it down – it’s fun, flirty, and oh-so-summer! Outfit Details: Simple stacked band bracelets, baby pink crochet top, floral fringe summer kimono, cut off denim shorts, cowgirl hat, and pendant necklace. Style Tip: If you’re trying to style a chainmail dress or top, this look has several pointers on how to nail your outfit. Neutral pieces with textural elements give the top the credit it deserves while still giving a very put together “I’m going to a rave” end result. Outfit Details: Chainmail top, backpack, choker style layered necklace, doily miniskirt, and bracelet. 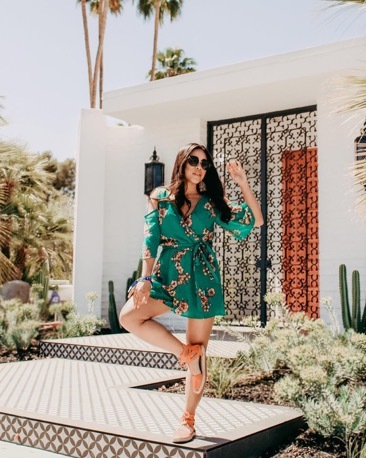 Style Tip: Boho is the end game for most Coachella outfits but you don’t need too many patterns clashing with each other if you’re someone who likes to keep it simple. A beautiful and fluttery maxi dress styled with cute boots and accessories can look as good as extensively complicated looks, given the right styling. Outfit Details: Floral maxi dress with off shoulder sleeves, tan boots, stacking bracelets, sunnies, and classic watch. Style Tip: When going minimalistic, stick to 2 colors and keep your accessories in that color zone. In this outfit, for instance, only black and tan make an appearance which adds gravitas to that white jumpsuit. Outfit Details: White denim playsuit, tiered necklace, beaded bracelet, sailor cap, tan boots, and fringe fanny pack. Style Tip: If comfy is your mantra when you visit festivals and raves, stick to the simple shorts & top combo but keep it interesting with prints and texture, like @lisadengler and her floral magic #Beychella street look. Outfit Details: Bishop sleeves top with floral embroidery, distressed cut off denim shorts, white crossbody purse, gold chrome aviators, pendant necklace, and metal bracelets. Style Tip: With set outfits like this, you can go all out with your accessories. As shown here, @naila has kept them to a minimum but a fringe handbag or a backpack, kimono with prints, and loads of cute stacking bracelets can work wonders to elevate a simple look like this one. Outfit Details: White lace crop top and shorts set, stacked bracelets, coin work boots, white bikini set underneath, and pastel cat eye sunnies. Style Tip: With slit maxi dresses like this one, a great way to dress up or add glamour to the outfit is by using stockings. Oxfords work great with this look but strappy sandals or pom pom flats would also look beautiful if you’re trying to enhance the hippie aspect of this outfit. Outfit Details: Slit maxi dress, straw panama hat, velvet choker, pendant necklace, rope belt, and Oxford shoes. Style Tip: Bell bottoms immediately draw the eye to themselves so it’s important to full @jessimalay’s example and keep everything else toned down. They can also be styled with a basic tank for a casual look. Outfit Details: Grey printed bell bottom pants, black crop top, double buckle belt, fringe handbag, peep toe sandals and classic sunnies. Look Towards Small Brands – Mass produced is out but more than anything else, generic is never trending. Smaller brands not only put more effort towards innovative styles but they also have a keen eye on the festival scene. Brands like One Tribe Apparel, Offbeat Cuts, Mali Pah, etc are smaller and have gorgeous clothing and accessories that would not be commonly seen on the festival circuit. Upcycle Your Wardrobe – If you have access to a talented local boutique that offers upcycling services or are a savant with the sewing machine yourself, you can turn your existing wardrobe into a wonderland. From a basic jacket becoming Beyonce’worthy to old washed out denim turning into amazing distressed shorts, there is no limit to upcycling your current wardrobe. 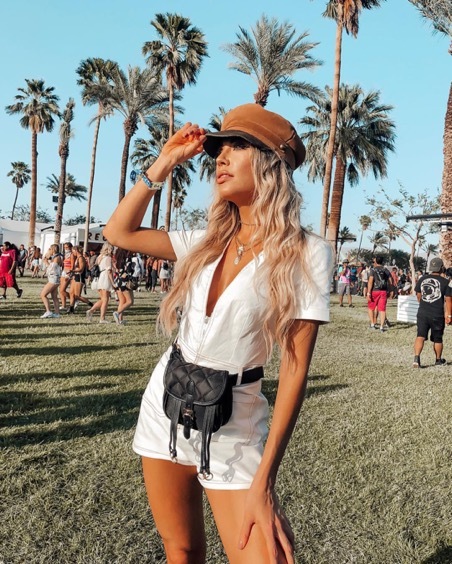 Wear Your Outfits Before Your Fests – A lot of people make the mistake of wearing their festival outfit for the first time during the festival itself. There are so many issues that can come up with this approach that almost no expert suggests it. While you’re not Kim K and can’t have a tryout session with your designer, your friends can be amazingly accurate when it comes to your outfits. Don’t Underestimate Accessories – No matter how out there your outfit is, accessories maketh or breaketh your look. If you’re going for an understated look, stick to small pendant necklaces or chokers, a basic bag, and comfortable shoes. If you have a simple outfit, you can go gaga over accessories to amp up your look. Look for big fringe bags, metalwork boots and shoes, pom pom sandals, bracelets, layered statement pieces, rings, anklets, body chains, and so much more. Look For Trends From Last Decade – It’s a well-known fact in the fashion industry that trends repeat themselves every couple of decades or so. For instance, the choker trend from the 90s made a comeback last year and is still going strong. So, when you’re planning your outfits, look towards the last decades and the trends that were big during those years. Remember the Importance of Comfort – If you’re going to a fest, you cannot forget that you would be out there in the sweltering heat amongst throngs of people. If your belt is too tight or your shoes give you shoe bite, you would not be able to enjoy yourself and it will ruin your entire day. So, remember that comfort plays a big factor in picking the right outfits for festivals like Coachella. And don’t forget to pack spray sunscreen that could just go on top of your makeup and not ruin your whole look. Coachella has always been my most favourite events of the year, I am in love with all the trends and styles this festival brings in. Totally loving your selection 🙂 Great picks!